Thinking of running your own LIVE event? James shares tips on organizing and delivering an event that will be beneficial to your business and your audience. 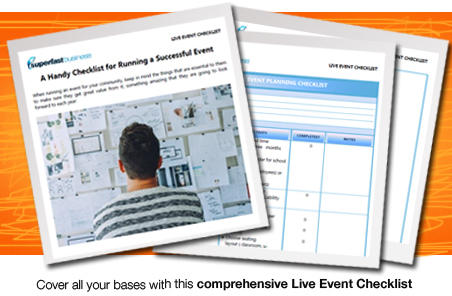 Plus you can access a live event checklist. 02:55 – Should you deliver a live workshop alone? 07:16 – How do you take care of your best customers? 10:30 – Is there an ideal number of attendees? 16:50 – What makes an event good? Hey, James Schramko here. Today, I’m just making a quick little episode about events. I’ve got this on my mind at the moment because I’m coaching a few people in SilverCircle, and they run events. They run high-level events. I’ve been doing debriefs. A friend of mine, Kyle Gray, called me up and he wanted to talk to me about events and what’s involved with those. It sort of brought out a few memories. I wanted to share those because I think the story around that might be interesting as I’m in the lead up to my own event, SuperFastBusiness Live. That’s actually the 12th event, the big event that I’ve run over a decade. There are probably some ideas that I could share with you that might help you if you’re thinking about running an event, that’s why this might be interesting. I’ll cover some specific differences that I think are different about the events that I run and how I advise my students that maybe if you’re running events, you could see if there’s something there for you. If you’ve never run an event, then this might save you a whole bunch of stress. So in terms of what we teach in SuperFastBusiness Live is very different to the old days. Before, we used to encourage people to bring a laptop. My very first event was pretty much a nightmare to organize. I thought that I would sell maybe 10 or 20 people a ticket to this event from stage at World Internet Summit. But it turns out, there were 550 people in the room at this event, and I had over a hundred people come along to my event. There were about 130 something people. They were bringing along their laptop. I had to organize WiFi. I was going to show them how to research a niche, find a product to promote as an affiliate, get an affiliate link, and then write the sales copy, find an image, put all of that onto a website, and make it go live on day two. I was told it was impossible. ‘This is not going to happen.’ But with the help of my clever friends like Dave Wooding, who is a genius technology guy, and Sean who helps me out with my events, we managed to bundle together some software that helped people build a website online. I was able to get a server from Liquid Web, and I was able to hook up WiFi somehow. All of the students were able to build a website. My guarantee, by the way, just in case you’re wondering how I made the offer so compelling, was that if you can’t build your own website, I will build it for you. I didn’t want to build 130 something websites. Even though I could have, I didn’t want to. So I really wanted to make this work. I used to deliver all my workshops by myself. So that’s a choice you can make. Back then, I did the whole two days, and then three-day workshops all by myself. It was only the fourth or fifth workshop where I started bringing in some guests. So you can decide – do you want to deliver the whole workshop? Do you want to deliver half the workshop? Do you want to have almost everyone else delivered except for you, and you just bookend it? Which is my preference now. I open my own event. I close my own event. and then I curate the absolute, best speakers that I can into my events so that I get elite, world-level experts. Because I acknowledge, I’m not a super specialist on several things. So I bring in people who are. 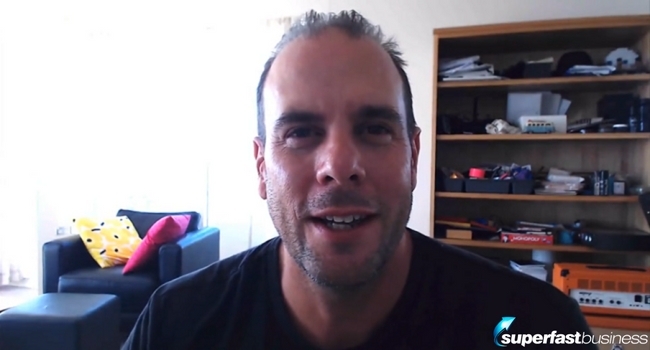 So my next event at SuperFastBusiness Live, for example, I have Ryan Levesque talking about the Ask methodology and also talking about how to do a 3.3 million dollar product launch. These are things that I’ve observed that he’s doing really well, and I get to work with him most weeks. Then there are other guys like Tom Breeze, who I am working with as well. He’s doing some amazing stuff with YouTube. Running YouTube ads for just about all the experts you could name. And then there are other specialists talking about Facebook and AdWords; because these are essential things for my community. This is one of the other important factors. So over the last 10 years, I’ve had to decide – am I going to have the same event over and over again and bring new people, or am I going to move with my customers and bring in new experts. That’s what I decided to do. I decided to grow with my community. That is why a lot of the people who come to my events come to the events over and over again. So this isn’t like the one-on-one course where we get all new class each time. I actually got an idea from a friend of mine, Kerry Finch, to keep bringing the same people back. I sort of run with that, and now, our events are so different to ‘Come along with a laptop, learn how to build a website.’ I would not tell people to learn how to build a website. Now, my customers have grown up. They’ve got six- and seven-figure businesses. Now, I tell them – hire someone to build your website, hire a designer, hire a website developer, get someone to write you a copy, because it’s more important that we focus on our high-level activities. And unless we want to be a professional website developer, and by the way, that’s a really hard job, don’t learn how to do that. So we’ve grown up with the community, and we have a high-level discussion. In fact, it’s also important to let people know who the event is for, and who it is not for. Because the whole point of having an event is to move people, to move them from where they’re at when they start and to have them end up where you think is going to put them in a better spot. If they can see that, they will buy a ticket. If they come along and get great value, they will come back. So that is my mindset around the event, and that’s the purpose. So for that reason, we cut out the whole pitch thing. I don’t want my speakers spending 30 minutes framing up how they used to live on a park bench, they were using a maxed out credit card, and then they came good, and then spending the last 30 minutes pitching their offer with a bonus stack and delivering virtually no content, because that’s how a lot of events run. When I go to those events, which I don’t do anymore, but when I was even speaking at some, it was distressing to see the low value presented. Also, it was pretty frightening to see how eager some people are to part with their money of a very strong sales pitch and a very weak content delivery. So we’re content biased, and here’s another reason why – my annual event is the glue that binds my live community. We have an online forum, SuperFastBusiness membership, and those members come, and they meet up. It’s like a super meetup. I record the sessions. The only way people can buy the recordings is to be a member of the community. In fact, I use the event to help bring in new subscribers to the membership. If someone buys a ticket to the event, and they’re not a member, then our automation using Ontraport will actually look and see – are they a member? If not, it will offer them a trial. If they are a member, then they get the first release tickets at the lowest prices. So you should always look after your members. That’s one of my big bugbears about banks and telecommunication companies. They don’t look after their best customers. But I do. I always give SuperFastBusiness members the best prices, the earliest releases. So think about how that might apply for your business. So now, after running these events every year, I’ve got a really streamlined checklist. I’ve seen so many things that people do wrong with their events. When you’re running your events, run a checklist. At least for your first event, write down everything at the end of the event that you think you did really well, and then write down everything that you would change. Some of the things, I’ll give you some clues here, some of the things to consider are – Did you get the right speakers? Were they right match for the audience? Did you brief them or survey the audience before the event so that the content is exactly what your audience needs? Were the session times manageable? Let’s stop these two-hour sessions, etc. or rambling, asking questions that just dribble over the breaks. That’s not acceptable. Keep your sessions tight. We run 60-minute sessions. We’ve got punchy content and then we have a break. The most I’ll back-to-back is two 60-minute sessions. People can go for one hour and 20 minutes with two different speakers. But don’t drone them anything past 90 minutes for a single speaker. The other thing that I’ve seen people do is they attempt to deliver too much content. Usually, when they get people there, they’re trying to think, ‘Well, I can give them the most content possible.’ But that’s not helping someone. That just locks them up and causes them to go into a death spiral of overload. Think: what is the minimum that I could deliver? How could I deliver just three points or one point and have it really stick? Could I have them do an exercise? Could they, by the end of a 60-minute session, have written down a very short action plan of three steps that will have a huge impact? Because if you could do that, that would be a great event. The other thing that you could do is regulate the room. Run to time. Start on time, finish your breaks on time, and have longer breaks. Let people socialize. Other little things that we do that are expensive and a little more detailed – we give people workbooks. We give people pens. We give people hoodies, like clothing so that they can stay warm in an air-conditioned room if they want, and also they will keep that. They will not throw out a hoodie with your logo on it. But keep the logo small and tasteful. This is my logo here. You can see that it’s really quite small. Don’t put the big thing all over the back. That’s just cheesy. The other thing that we do is we feed people. They get arrival tea and coffee. They get morning and afternoon teas with healthy snacks. Not horrible, sugary food, but like healthy stuff. Give them food that’s going to give them nourishment and not cause their body to go into a sugar lockdown. And we feed people. So after they come out at lunch, they get a long lunch break, and it’s right there, and then they can talk. So you can actually meet people. You can have a deep conversation. How many people should come? The other thing is to consider how many people are coming to the event. I found a group size of between 150 to 250 is a really good size group for a multi-day event where you could pretty much meet most people and cross pollinate within that group. You start going to 500, a thousand, 2,000, you’ll definitely not meet everyone, and it becomes impersonal. And of course, 20 or 30 people, if it’s your first event and you want to run a little one. Even five people or six people is a very comfortable size around a boardroom table. So don’t be discouraged even if you can have two people. The least amount of people I’ve ever had at an event is one person [laughs]. And that was still a $3,000 ticket price. That person got insane value. They redid their whole brand and has gone on to do very well. I’ve run a few events with two people. The very first event I ever run was just two people. And it was while I still had a job, and it was my test. So I wrote the sales copy, I advertised, I sold the ticket to two people, I delivered the content, I followed up, and they got great results. Start with a small one if you’re not sure about this because your reputation is absolutely everything. Give it your best shot at helping people. Other things that we do is I’m constantly innovating. I survey people post event, and I ask them what they loved and what they could do without. I go deeper on the things that are good. This year, I’m trying multiple spots for my experts. So they’re getting really deep. About three or four of my speakers get two spots so they can use those spots to get in nice and deep and to really make an impression. 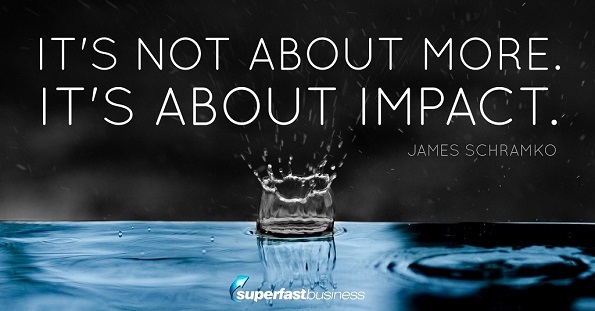 So it’s not about more, it’s about impact. The other things that I do is I work with people who I trust. I either coach them or I use their products, and it has to be absolutely relevant for my audience. It’s not just someone who’s going to come along and sell a lot of stuff, which is pretty much the choosing criteria that a lot of seminar presenters do. It’s not just big ticket names who are going to help me sell tickets. I don’t ask my speakers to promote the event. I don’t have an affiliate program. I don’t run a huge amount of advertising. We sell a hundred tickets on the first email out to members. That’s how strong the reputation of the event is. So think about how can you create Grange? That’s the metaphor that we use. At each event, I give away a bottle of Grange. It’s how do we create something meaningful, something amazing that people are going to look forward to each year? And see how you can make it more of an experience. So I put things like lifestyle in there. We go surfing. So if you come to my event, we’d have education. It’s heavily curated to be just what you need. The speakers are briefed on making it really actionable and high-impact. Then we also record it so people can follow up in the forum and discuss it and ask more questions. We feed people, we clothe people, and we surf. So we do a team/individual exercise where we all go surfing. There are about 60 people who go surfing on the Friday afternoon, and it’s fun. So it’s a bucket list. It’s an experience. People stay days before and after. How can you make your events more exciting than just some slappy hotel room, mints-on-the-table type business talk, la la la, people out in the hallways disrespecting the content. So make your event good. Other little things like when you’re having microphones and questions, put them in the center aisles, and encourage people to go to them so you can zoom your camera in on them, and you can record the sound. Just a little tip. The other thing to do is chapterize your modules. At my events, each session gets its own start slide. It’s framed up and introduced. Each one of those becomes a training module inside SuperFastBusiness membership. So people can easily find that session. They’re not trying to scroll through eight hours of random footage. Keep it chaptered like as if it’s a book. It’s a wonderful way to format it. I record my events on two camera setups. It costs more, but it looks beautiful and give the speakers or the expert their version to use wherever they want. Invariably, they’ll give it to their members. They might put it up on the internet, and it’s only going to help you as well. A nice little thing that you can do – if you really want to sell and make a lot of money from your event, fine. But I found I can still be profitable just selling the ticket and then reselling the membership recordings. Plus, if there’s a topic that comes up really well in your post-event survey, do a webinar with that expert after the event. Last year, I did one with Andrew Lock, and it sold really well. We were able to make 40 sales at a thousand dollars each from one webinar with 100 people coming to that webinar. It was because that was the most interesting topic of that event. 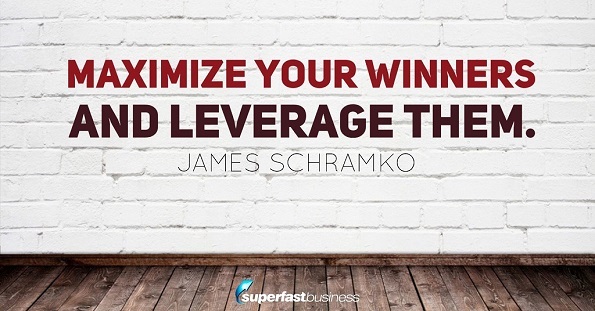 So maximize your winners and leverage it. You could do it with each speaker if you want. The other thing to do is with your checklist each time you run an event, get into it early and tick off the boxes. One of my virtual assistants actually helps me. We share a project management tool, and she just prompts me. She says, “Have you done this?” “Have you done that?” We get it all locked down nice and early. In fact, I’ll usually rebook a year in advance. I pay for things early, and I get all my suppliers on side. They love working with us because we are no fuss, we’re great payers, we’re very consistent, we know what we want, and we’re not drama queens. In terms of crew, we have a speaker wrangler who looks after the speakers and make sure they’re having a great time. They can mic them up before they go on the stage, they can run microphones, they can help people find the bathroom, they can monitor the door. We have people doing registration. We have people doing the time keeping so that we run strictly on time. We have someone’s who’s just a liaison to the event management so that if the venue wants to ask us something or get a question answered, then they can deal with them. It can’t be me because I have to be there to talk to my customers and to make sure that the show is incredible. I attend every session, and almost all speakers attend every session because the content is that compelling. That’s what makes a good event. It’s so easy for people to access the speakers. We don’t have a VIP room where the speakers hide. We don’t have a super special sitting where they can be off to a side. We just have front row seats for my SilverCircle members. They can come in and out of the room early. So do something special for your best customers, which is what I mentioned before. I also join a SilverCircle day the day prior to the event where I just bring in the speakers and my highest-level customers to mingle with each other and to really get some good stuff going live because that’s our once-a-year event because the rest of my program is virtual. So think about how you can leverage before and after the event for other purposes. I hope some of these ideas are useful for you. What I’d like to do is I’d like to field questions. Ask your question below the post. I’ll do my best to answer them for you. And of course, if you can come to SuperFastBusiness Live one year, I’d love to see you there. Let’s go for a surf.